ICG offers a variety of research experience placements aimed at providing experience of working as an academic scientist. Undergraduate Projects Available in 2018 will be posted when available. For details on how to apply please continue reading. 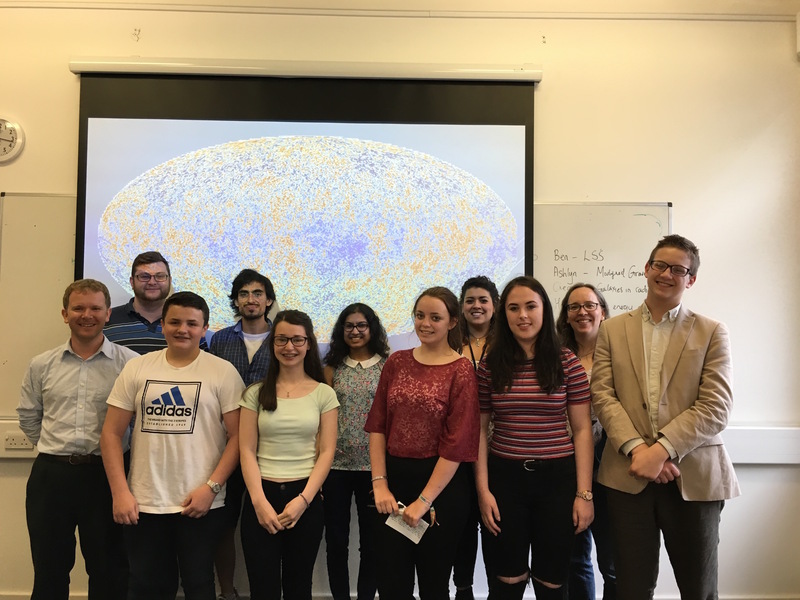 Undergraduate student at SEPNet (South East Physics Network) Universities can apply for the SEPNet placement scheme to spend eight weeks working on a research project at ICG. The scheme is only for physics undergraduates on Year 2 BSc/MSci/MPhys programmes and Year 3 MPhys/MSci programmes at SEPnet partner universities (Hertfordshire, Kent, Open, Portsmouth, Queen Mary, Royal Holloway, Southampton, Surrey and Sussex). Eligible students will be emailed instructions about how to apply. Every summer, the Ogden Trust offers 6-8 week paid internships. These are open to Ogden alumni (i.e. gifted physicists (mainly) currently or previously on means-tested scholarships). They are advertised to Ogden undergraduates in all years and to Ogden students in their final year at school. 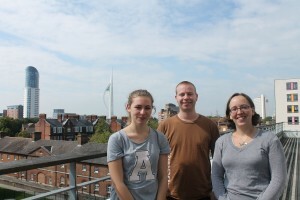 ICG is pleased to support this scheme and continue at least one Ogden placement each summer. Students must apply via the Ogden Trust. 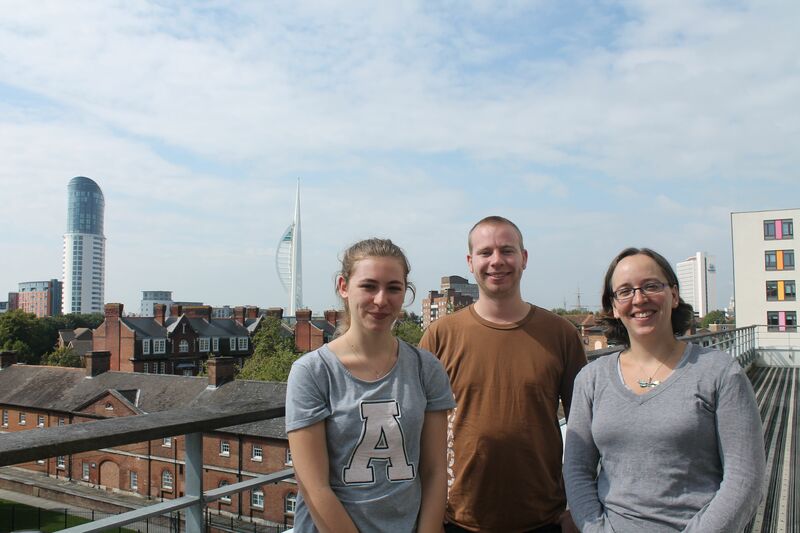 We are sometimes able to support University of Portsmouth funded projects. To apply for these (if you are not eligible for either SEPNet or Ogden) please send an application to Dr. Dan Whalen (daniel.whalen ‘at’ port.ac.uk) by the end of March 2017. This should comprise a CV (including details of your University units and specific details on marks in different units) along with a cover letter indicating why you are interested in a placement in Portsmouth, and what type of project you would be most interested in. For more information on potential future public engagement placements please contact Dr. Jen Gupta (jennifer.gupta ‘at’ port.ac.uk). 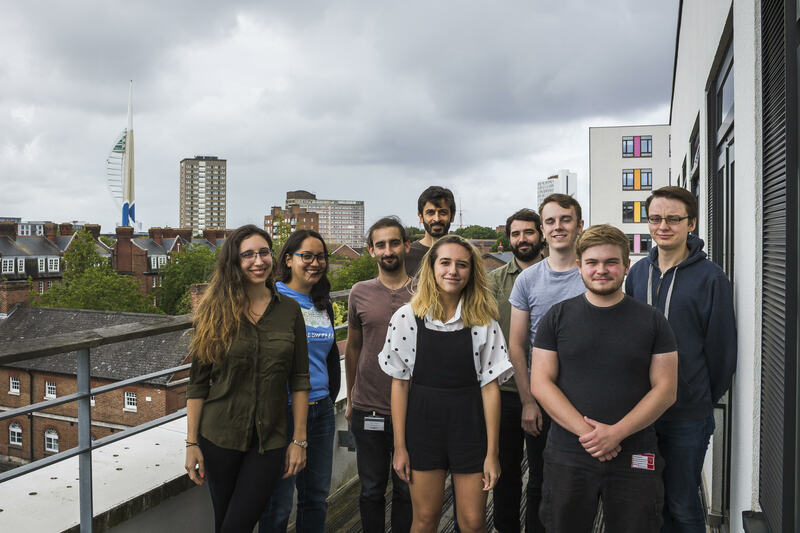 Nuffield Research Placements is a UK-wide scheme giving students in the first year of post-16 studies a chance to work alongside professional scientists, technologists, engineers and mathematicians for 4 – 6 weeks over the summer holidays. ICG has supported this scheme for the last several years, typically taking 1-2 students each summer. In their first year of post-16 studies (Year 12 or equivalent). Studying one or more A-levels (or equivalent) in maths, science, engineering or a technology-related subjects. Studying at a UK school or college and resident in the UK. Available for a minimum of four consecutive weeks during the school summer holiday period. Have 5 GCSEs at grade B or above, including Maths, English and a science. Have an interest in studying science, technology, engineering or maths at university. Want to find out more about careers in STEM. To ensure no-one is excluded because of financial need, travel costs are provided for all students, and means tested burseries are also available. Students from all schools and colleges in the UK are eligible to apply to the scheme. However,the Nuffield Foundation (and ICG) are particularly keen to encourage students with no family history of Higher Education, or who have not had the opportunity to participate in an enrichment activity of this nature before, to apply. Only a small number of places on the scheme are awarded to independent students each year. For more details on How to Apply, please visit the Nuffield Foundation Website. The application deadline for Sussex & Hampshire this year is 24th March 2017. Please indicate your interest in ICG based projects when you apply. Summer 2014: An investigation in how the prominence of spiral arms correlates (or not) with measures of ongoing star formation in spiral galaxies. 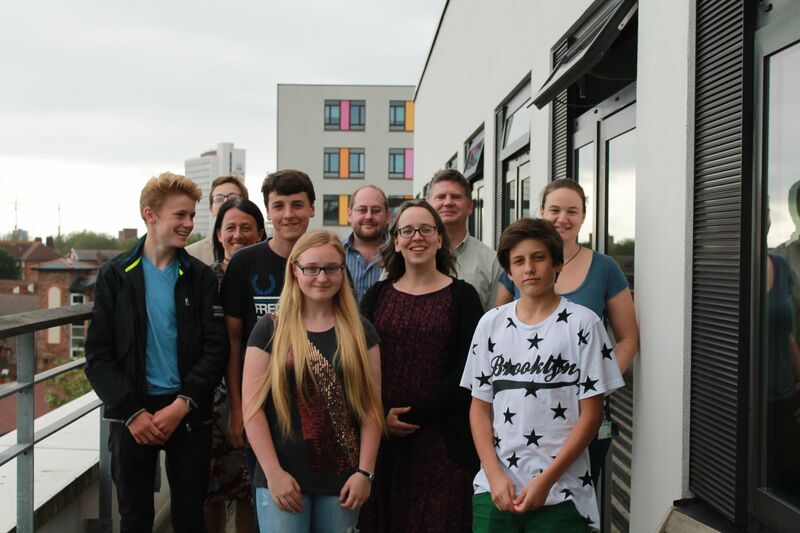 In June we sometimes run a special “work experience week” inviting local young people from Y10 to spend a week at the ICG. This is a chance to experience the environment of a professional astronomer or cosmologist. You will work on a small research project with a research supervisor (one of the ICG Academic Staff or Postdoctoral Researchers), as well as participate in a range of specially designed activities (e.g. tailored lecturers, and a campus tour). You will also get chance to meet other young people interested in exploring astronomy/cosmology as a career. Unfortunately we are unable to run this in 2017. We hope it will be back in 2018. We especially encourage applications from students who aren’t sure that a career in science is for them, but are interested in exploring their options. 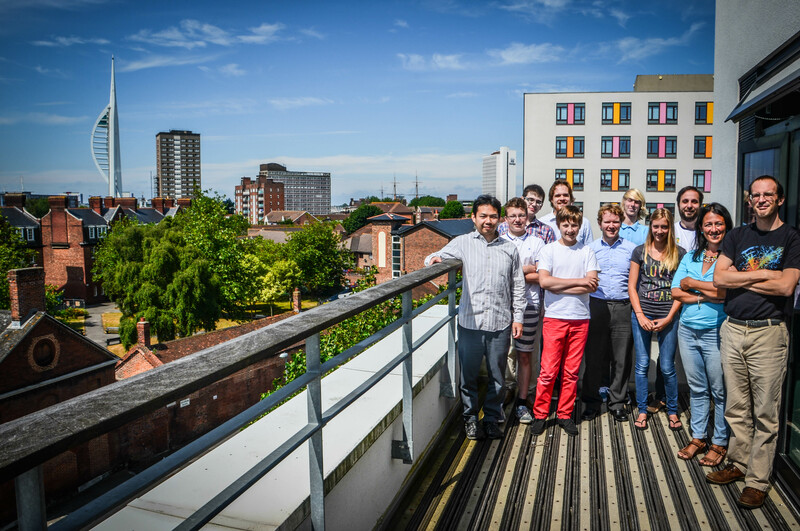 Work experience students in June 2014 with some of their ICG supervisors, on the terrace of our building. Work Experience visitors from 2015 with their ICG supervisors. If you would like to discuss a different research experience placement we may be able to accommodate a your requests. Please contact the ICG Work Experience and Research Placements Organizer, Dr. Dan Whalen via daniel.whalen ‘at’ port.ac.uk for more details.